I got some really great shots of the Winged Wildlife in the garden, but for some reason, I particularly like these two photos. 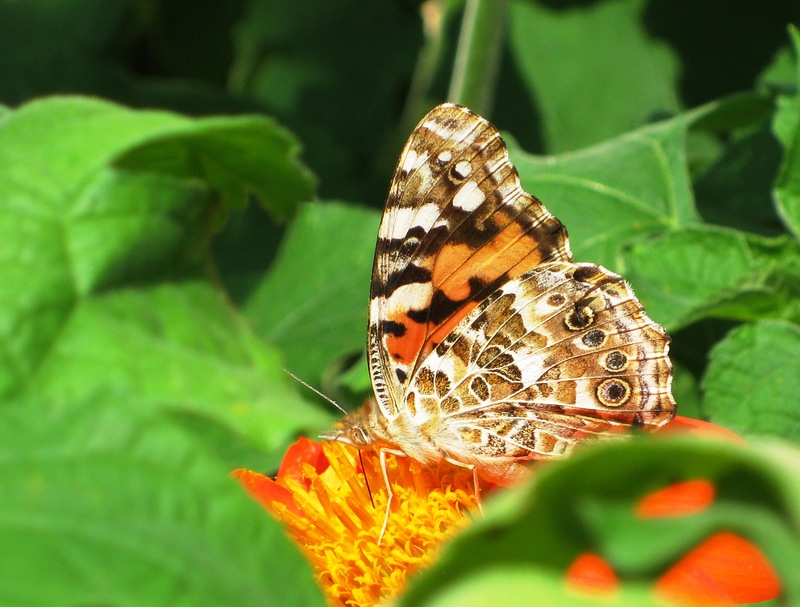 I hope I’ve identified this beauty correctly as the Painted Lady. The wing patterns are complex and stunningly colorful. I also happen to love the orange Mexican Sunflowers (Tithonia). If you ever want to attract different species of butterflies, then I highly recommend planting this prolific and bright blooming annual. My apologies for not posting/writing more often, as well as my lapse in communication. I have a lot on my mind and so for now, I hope you enjoy the images I share. Winged Wonders, a photo by Rosa Blue on Flickr. Today, I’m practicing accepting the moment. My other options don’t look good. I have a lot on my mind, some of which I simply don’t know what to do about. I’m taking a break from trying to come up with solutions, at least for a little while. I’ll take another break in a few minutes, with my pretty, insect-hunting four-legged companion, Ruthie Mae. She needs me, and I need her. She let me know today how much she loves me, and how she misses us spending more outside time together. She walked over to me, as I was rubbing Tiny’s belly, which he loves of course, and put her paw in my hand in the sweet way she has always done,ever since the first time she introduced herself to me. Ruthie does have good manners, even though, she doesn’t use them a lot of the time. She looked me in the eyes, as if to say, hey thanks for loving us, and then she gave me a soft little kiss on my hand! I promise you she is one of the sweetest dogs in the whole wide world! I’ve regressed. I meant to talk about butterflies. I’d like to share a photo of the beautiful butterfly that I was friends with today. I make a lot of garden friends in Horticulture Therapy. First it was the lizard, then the ladybug, and recently my son spotted a lizard by the bog that had an orange throat, and of course, butterflies! 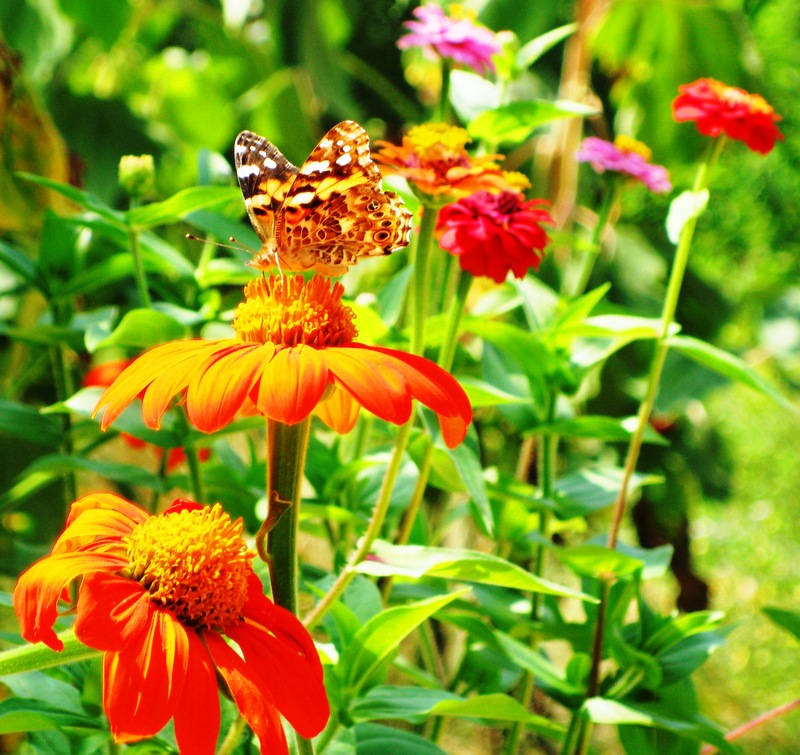 I love the butterflies, but I’ve noticed that I do love all my garden friends. I must go check my books of butterflies, my favorite of which is, BUTTERFLY GARDENING, FOR THE SOUTH, by GEYATA AJILVSGI, if I can find it. I have nature guide books, but let’s find out what Geyata has to say about this amazing and beautiful creature. Though the Zebra Swallowtail has bright striking colors, when it goes to rest in the shade, it gets a little darker and blends in with the environment. I know one thing this butterfly likes, and that’s drinking from Asclepias Tuberosa, commonly known as Milkweed, which is a nectar producing flower, but is also the plant that Monarchs lay their eggs on. Milkweed is the only plant Monarchs use to lay their eggs on. 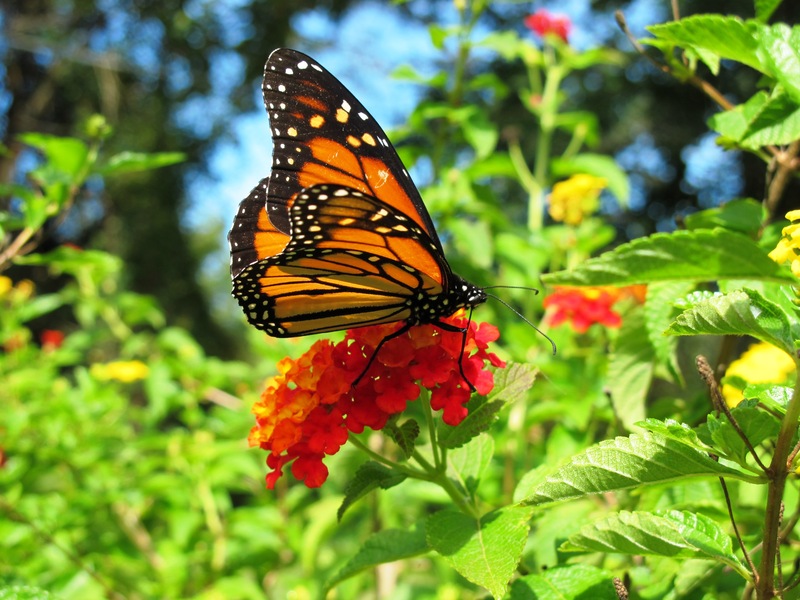 Something in the plant makes the Monarch poisonous to prey. I once dreamed I was a Milkweed plant. I was happy and lived in a great large field with many others like me. But, that’s a story I’ve told in this blog. Ruthie Mae says I don’t have time to give you the link. That’s it for today. The sun has gone down, and my girl needs a walk. It’s almost time to start thinking about what you might plant in your garden. I encourage you to plant a few larval food plants so that you may get to watch a butterfly happen in your own backyard. Beautiful Butterfly, Share your Magic! Will you come to the garden? These butterflies didn’t come for flowers. They have come for the sap seeping from a wounded Oak in my yard.